2-4 years: Monday-Friday or Tuesday-Thursday, 9 a.m.-1 p.m. Looking for a great Jewish summer camp in New York for kids 2-to-4-years-old? Staffed by our experienced teachers, the Stephen Wise Free Synagogue Early Childhood Center summer program is available both for children enrolled in the school, as well as neighborhood children who are interested in a fun, warm environment that fosters learning through play. The program gives children access to many of the school's resources such as our rooftop playground, terrace, indoor playroom, art studio, and state-of-the-art water machine. 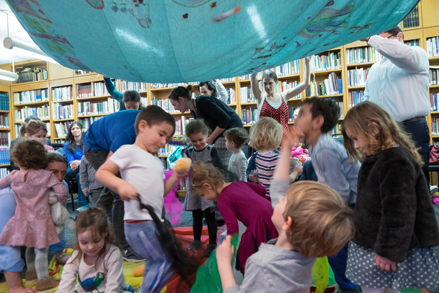 Children can look forward to summer projects, outdoor gardening experiences, community themed days like "Pajama Day," and weekly Shabbat celebrations. Our Juniors program offers an opportunity for incoming toddlers joining the ECC community to get to know the school environment, begin to become comfortable with classroom routines, and meet other children and teachers they'll be seeing in the coming school year. Please note that a grown-up must accompany your child during class. To learn more about this Jewish summer program, please contact Melissa Hume at or 212- 877-4050, ext. 264. The 2019 Summer Program will run from June 24 to August 2, 2019, three or five days a week, from 9 a.m. to 1 p.m. (We will be closed Thursday, July 4, 2019.) Children may attend weekly for a minimum of two weeks or for the full six-week session. This program is for children who have already attended a school separation program. The three-days-a-week option is available only to children who are currently in a 2s group. Dependent on interest, a two-week extension may be available from August 5 to August 16. This option will only be available for those who have registered for a minimum of two weeks of camp prior to the extension, and children must register for five days per week during the extension. Registration forms are due by Friday, March 1, 2019. Forms received after this date will require an additional $25 to be processed. Summer Program fees must be paid in full by May 3, 2019, and are non-refundable. 5 Days a Week, Monday-Friday, 9 a.m.-1 p.m.
3 Days a Week, Tuesday-Thursday, 9 a.m.-1 p.m.
3 Days a Week, Tuesday-Thursday 9 a.m.-1 p.m.